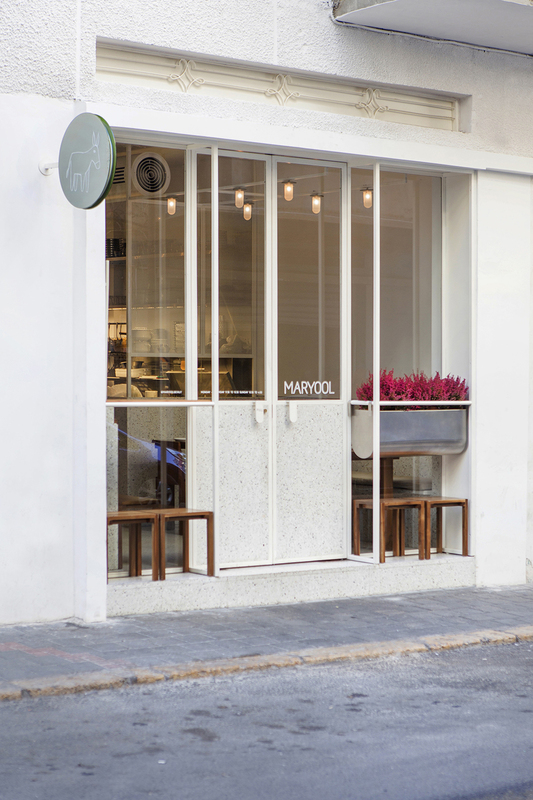 MARYOOL – Arabic for apron – Beirut based eatery, designed by architects Ghaith Abi Ghanem and Jad Melki. At the heart of the restaurant are historic utensils collected from markets and homes all over the city, incorporating familiar totems of the everyday household into a contemporary dining experience, complementing Maryool’s fresh menu of re-worked traditional dishes from the Levant. Our concept translates the traditional home kitchen into a contemporary dining space, departing from the namliyyeh: the cabinet that holds the kitchen’s utensils, the tools that allow the space to function. Historic household objects have a tendency to trigger nostalgia. What if we are capable of reducing the familiar to its simplest elements, impeccably designed, in order reframe those interactions that take place in the home, without rendering them romantic? The result is a minimal space, characterized by the daylight that enters it. At the entrance, Maryool gives onto the street, connected to the urban context of Beirut; the far end overlooks the building’s silent back garden. As the restaurant stretches between these spaces, the design emphasizes the porosity between cooking and dining—amplifying experiences of gathering, preparing and sharing food, reflected in Maryool’s menu. Instead of having the kitchen backstage and invisible, separate from the sensation of eating, the preparation of food sits, visible, at the centre of Maryool. 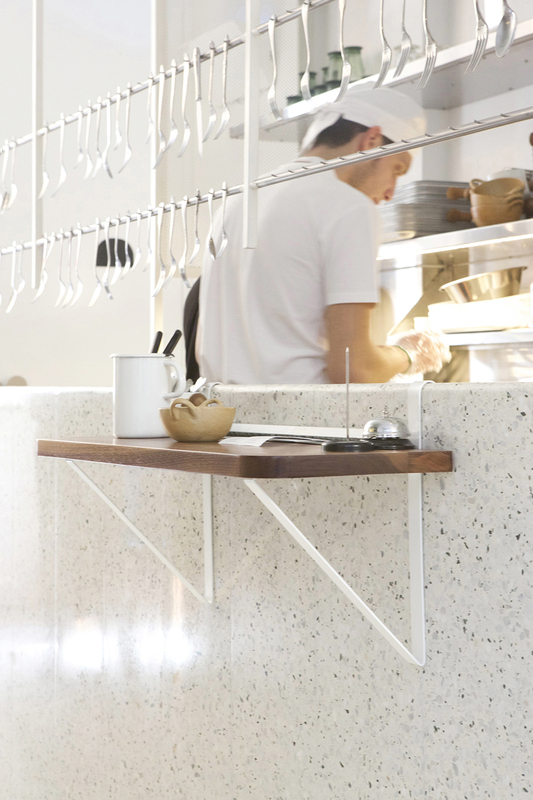 Spatially, our intervention splits the kitchen into two kiosk-like structures, one for cold dishes and one for hot dishes. A passage between them connects the two gathering spaces at either end, serving not only a practical function, but a performative one: it hosts a series of collected utensils from different homes in Beirut, hanging on the two porous facades of the kitchens. Each of these pieces of cutlery is unique, with ornamentation of its own, memories of its own, and histories of use in different hands. 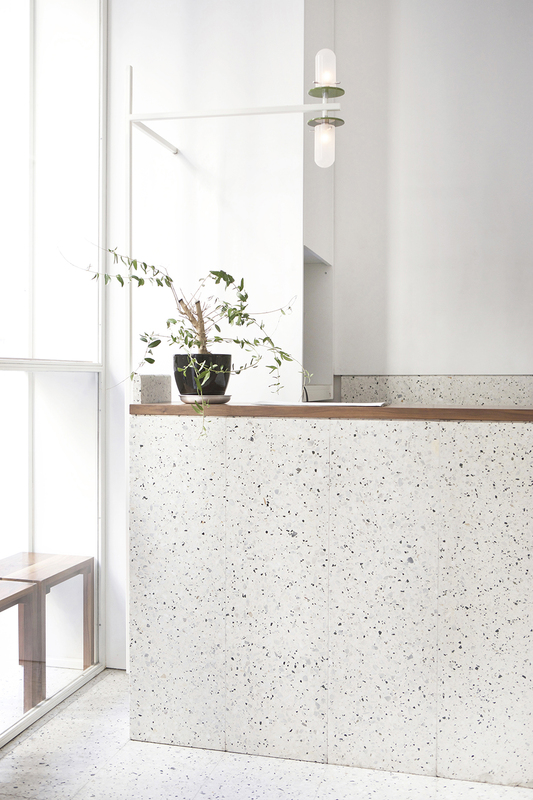 The intimate domesticity of the space and its utensils is reinforced by the muted aesthetic of white walls and freckled green and white terrazzo stone, splitting the space—this time vertically. 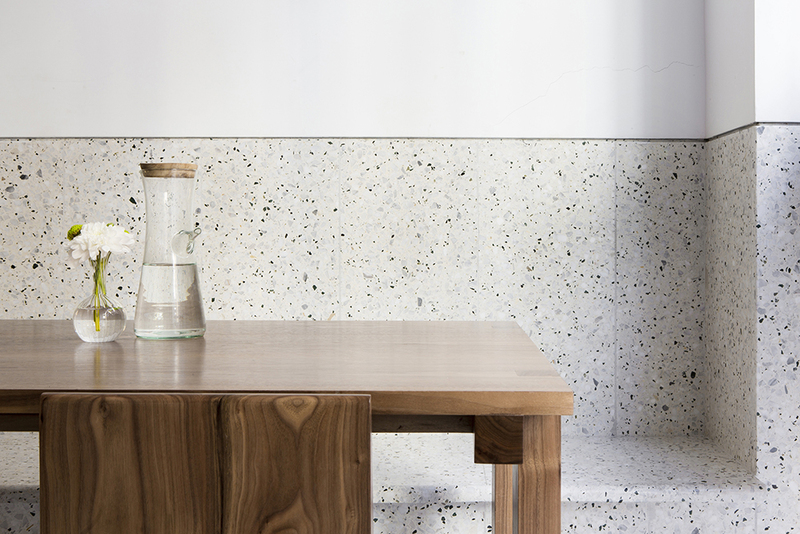 The terrazzo covers the floor and creates the benches and the kitchens parapets, a spatial tray with colors inspired by the Mediterranean. 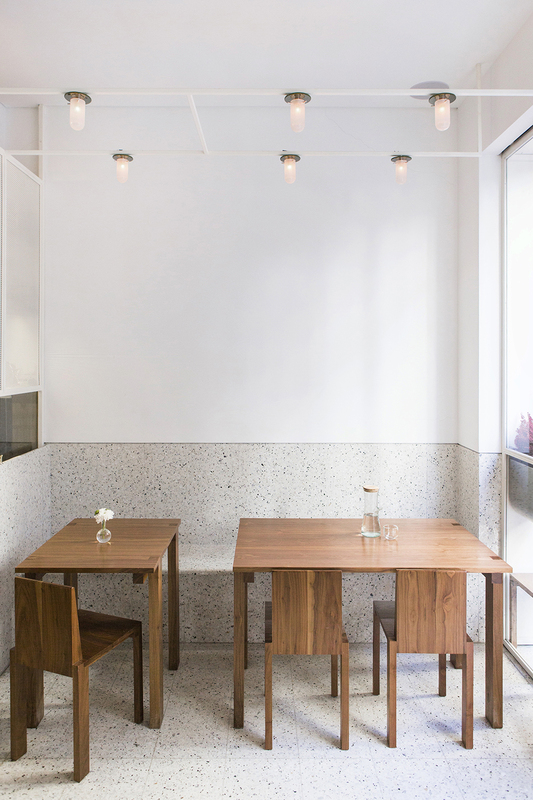 Tables and seats are custom-made of walnut wood. The focus above dining level shifts to the hand-blown lighting fixtures, complementing the open kitchens, the bustle of food preparation, the hanging utensils and the animation of the space by those who enter it.